Pioneers in the industry, we offer walk in cold rooms, cold room and cold rooms cabinets for dairy from India. We are leading exporter of Walk in Cold Rooms. 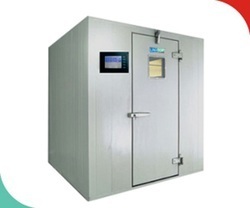 We are leading manufacturer and supplier of Cold Room. Prefabricated modular type construction with high density CFC free PUF insulation. A safety alarm system is provided in case of any emergency. We introduce ourselves as an eminent manufacturer and supplier of Cold Rooms Cabinets for Dairy. Looking for Walk In Cold Rooms ?